I was just reading Shannon Doak's G+ postings when I found her posting about Christopher Emdin's TED talk called Teach Teachers How to Create Magic. In this presentation, he talks about using Hip Hop Pedagogy to engage students in learning. He is a dynamic teacher who knows how to talk with people. I must admit that I was a little disappointed in his work because he was just talking about teachers talking with students. His Hip Hop talk was about how to make lecturing more engaging. My question is that maybe the problem is in the pedagogical structure where the basis of the teaching is lecturing. I would like to see less lecturing and more student-based interaction with content. I found his Dr. Emdin's website and Dr. Emdin is a prolific writer and engaging speaker who makes learning interesting. The only question that I have is that if the students are just listening to a teacher rap, where is their proactive learning occurring? I watched another of his videos where he talked about students sharing their ideas on a blackboard wall, but what were the projects that they were completing? Should a learner's sense of engagement be based upon how well a teacher can speak or how well teachers can challenge students to create projects to solve problems. I don't know much about Dr. Emdin's Hip Hop learning, but he appears to be a man who is addressing change in education and will be well worth following. What else should we know about his work and vision? This marks the beginning of a series of UNI Connect-A-Tech Webinars where we will be talking with Instructional Technology alumni who are working as professionals in their fields of choice. You will have the opportunity to interact with them through a video conferencing system. Read the information below to see how you can be involved through a video conference, on your phone, or come to our classroom at UNI (Schindler Education Center 405). If you have questions: Contact Nikki Lyons or use the comments below. Wondering what it takes to be an Instructional Designer? Here is your opportunity to meet with successful instructional designers and ask them the questions you want to know about the profession. The folks over at Emerging Ed Tech recently did a survey of their readers to find out what they wanted to know about education and Instructional technology. They had 160 replies which is a good response. This table is a list of their results. Some of the issues are standard issues, but it looks like they are feeling the challenges of integrating 21st Century Learning strategies in their classrooms. Admittedly, this is not a cross-section of all teachers, because there is a specific group of teachers who read their website. These teachers are forward looking. They are the ones who are trying to improve their leaching/learning environments. They are the ones who go to conferences and are continually reading and watching and connecting. I look at the list and and all of them are concerns of mine. How does this fit what challenges you in your teaching? 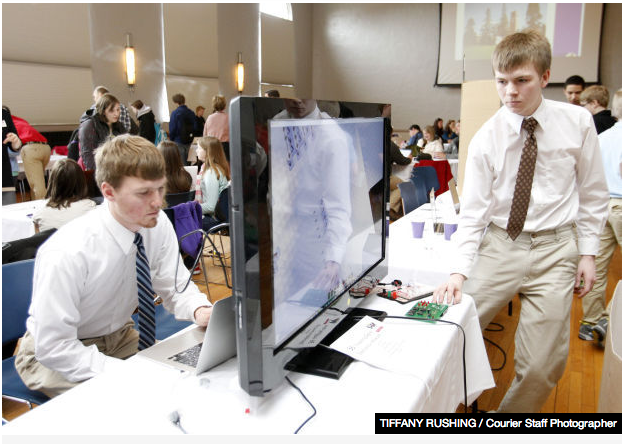 ITEC Student Technology Fair Makes it in the News! The success of the ITEC Student Tech Fair was shared in the Waterloo-Cedar Falls Courier in an article entitled Fair Brings Students Together to Share Their Technology Projects. Click on the link above to view 4 wonderful photos of students at the fair and read interviews with students, teachers and those who made the fair possible. ITEC Student Technology Fair Showed Exceptional Students Sharing Exceptional Projects!!!! 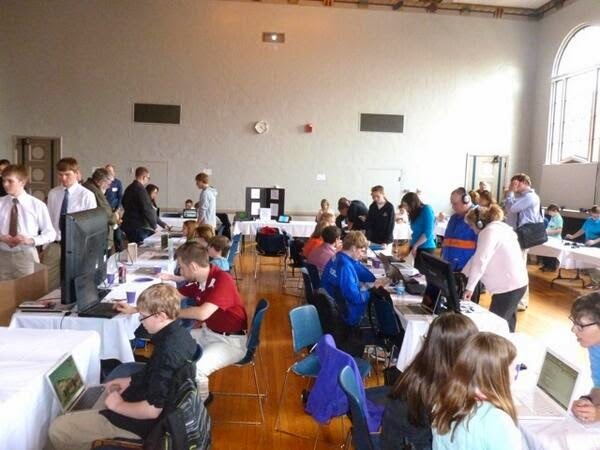 On Friday, we hosted the ITEC Student Technology Fair at the University of Northern Iowa. 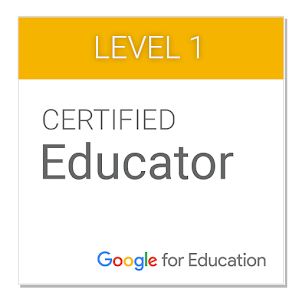 ITEC is the Iowa Technology and Education Connection organization for teachers who are interested in educational technology. Every year we sponsor 3 student technology fairs across the state: Ames, Sioux City and Cedar Falls. These student technology fairs provide a venue for students from 3rd - 12th grade to share what they have been doing with technology. It's not about the technology but it's about what students can achieve and explore with these tools. This year's Cedar Falls fair was incredible. The quality of work was beyond anything that I have ever seen at our fairs. The students ranged from 8 to 18 years old. They displayed imagination and innovation that exceeded past years' fairs. Blue and Red ribbons are awarded, but Purple Ribbons are presented to exceptional projects that "stand out" from the rest. The Purple Ribbon award winners are invited to present their projects at our October ITEC conference in Des Moines. Purple Ribbons were awarded to 5 of the 46 projects displayed. This is a higher ratio than ever before. A team of 13 year olds from the Blessed Maria Assunta Pallotta Middle School (in Waterloo) who had learned the Python programming language on their own and created an anti-abduction program. The intent was to create a program for a safety button that would send GPS coordinates to a parent if a child gets in trouble and presses the button. They were already working with law enforcement to develop this project. Students from Metro Alternative High School in Cedar Rapids who were using CNC programming to run a mill to create molds for making candy bars advertising the school. They had just begun another project where they were created molded soap that said "Wash Away Stereotypes." Students from Grinnell High School who had "hard coded" a website entitled Permissions Impossible which worked as an online dictionary describing app permissions. A 16-year "George Lucas" from Maquoketa High School who uses the Adobe Creative Suite to create an amazing video, Technology in School. A 17-year old from Oelwein High School who had created 3D images to redesign a oil refinery for a company in Arizona. Beyond that, we had students who were creating solar systems, writing music, developing mathematical games, exploring MineCraft, connecting with President Obama, running robots, designing homes, animating book reports, and informing others about cancer. It was an extraordinary fair with extraordinary projects by extraordinary people. I hope that you can attend our fair next year. It will be in early April. Do your students get an opportunity to participate in a Student Technology Fair such as this?